The head bolts and washers are supposed to be lightly oiled. [Page 113-11 of the Bentley] Also on that page is the torque spec = 40 Nm (30 ft-lb) +90* +90*, and yes these definitely stretch. I think I calculated it back when doing it and the deformation starts around the beginning of the second 90* turn. So this means that if you only got as far as the first 90* on the first 4 bolts, then the bolts are probably not stretched, and can be re-used. EDIT - I just remembered how I figured out when yield starts - it was based on the thread linked above. In that, I observed a stretch of about 1/3 of a full thread, or 0.5 mm (of the 1.5 mm thread pitch). That corresponds to 1/3 of a full turn, or 120*. So the yield should start after the first 60* of angle in the +90* step is applied. This is all approximate, of course, but should give an idea. And that's for the coated steel head bolts going into the Aluminum block. With the TimeSerts, it is a coarser interface. The TimeSerts are steel with a coating similar to that on the head bolts. I used plenty of oil on mine. I also made sure that the bolts all spun through the inserts pretty easily before putting the head on - to be sure that the torque I'd be applying would be for clamping force rather than fighting a binding resistance that is not there on a normal block. That #5 in the sequence is between cylinders 2 and 3, intake side. Well surrounded, but also in the middle, where it's common for the block to weaken and also to need clamping force. Here's a thought about what I found to be tricky with the TimeSerts, that might help you figure out what happened. The bottom 2-3 threads on the inside of a TimeSert insert are purposely not completely cut. In the TimeSert kit is an installation tool which is kind of like a super sharp slightly squared screw. The way it is supposed to work is that you use that tool to screw into the insert, then it conveniently stops right above the bottom 2-3 thread bulge, then when continuing to turn it, instead of the tool turning inside the insert, the insert turns inside the tapped M12-1.5 hole until the insert bottoms out (a flange at the top of the insert lands). Then at that point, you keep turning the tool and the sharp male threads on the tool press that bottom bulge on the insert into the block, locking it in place, and also finish cutting those bottom threads in the insert. Yes, I said that's how it's ***supposed*** to work. In doing some other TimeSert jobs as kind of practice before this one, I found it to be not perfectly reliable, no matter what I did. The most common problem was that the tool would start forging past the bottom bulge before the insert was fully seated. And then it's stuck. So the change I went with was to instead use a M10-1.5 (LOL - you know I might have used a stiffening / reinforcement plate bolt on this, since the plate was off) bolt rather than the special tool to install the insert, all the way until the insert was seated, but not deep enough in to push past the bulge. Then I'd remove the bolt, and use the special tool to forge clean threads through the bulge area. So the regular bolt was used to do the insertion to fully seat the insert. And then the insertion tool, with its sharp threads and squared profile would then come in to do the final forging of the bulge threads. With sufficient light oil, this worked very well. It's an extra step, vs. just using the special tool, and I'll guess TimeSert would rather present their product as being very easy, with few steps. Also, these engine block inserts are about 3x as deep as normal ones, so there is more of a chance that the insert will bind while driving it in, causing the tool to forge past the bulge too early. Seems weird that the insert broke in two, and now you can thread a bolt through it. Any chance there was some debris from tapping collected at the bottom of the hole? If so, then the bolt would bottom out on that and yes, you're just doing angle at that point so you could rip things out. But I don't know why the bottom 1/2" would survive, but the top 3/4" would come right out. I would tune that thing up the best you can - run the insertion tool through it to make sure it is fixed in the hole (the bulge is well formed and the insert is pressed radially into the block threads). Then I'd try to torque down a bolt in that hole. Some other bolt of the right length, etc., so you're clamping it down, but without the head in place. See how much torque it can hold. Hopefully about 50 Nm - it should not yield at that point. Then when you reinstall the head, go for that number - whatever you torqued it to in this proof test - on that one bolt. Going further would risk stripping it out, requiring a full retreat. If it fails the proof test here, at least you know now, and can go for a bigger bolt or insert. Last edited by oldskewel; 04-03-2019 at 01:50 PM. Thanks for the detailed replies. Unfortunately I no longer have the Timesert kit to experiment with but I did put a camera in the hole last PM. A little hard to see but no debris is evident. 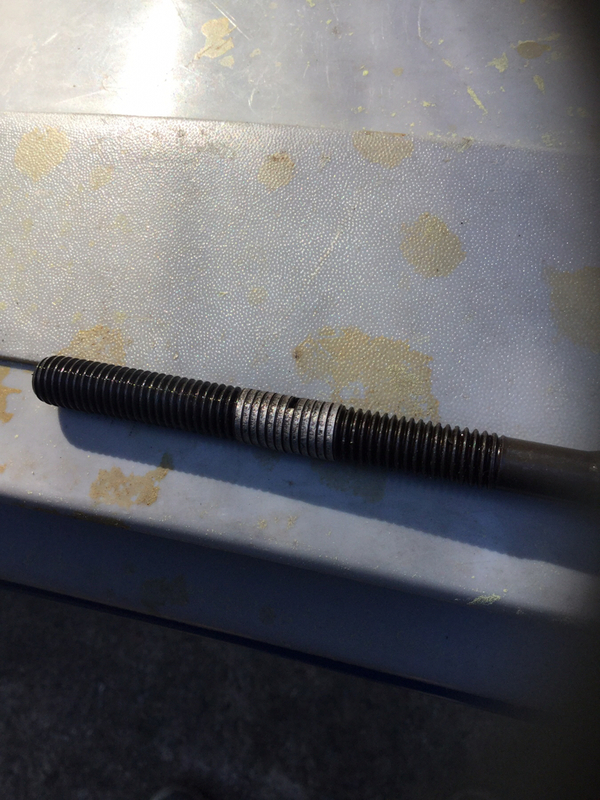 I put one of the old head bolts in and tightened it down (but short of torque spec ) and it definitely still has some threads but it felt like it bottommed, with the head off. I may be able to borrow a timesert kit from my local friendly Indy- more like rent- but he has no Serts. He’s a BMW specific shop that says he has done quite a few Timesert jobs and in his opinion the block is toast, that overheating has caused the aluminum to weaken. Says I should replace the block- pretty far above my pay grade. So, unless I can find a way to get the head on tight I’m looking at a new block, new engine or giving up on what was a bad idea to begin with. Here’s the broken sert. There is a couple of more threads that disintegrated also. From the looks of it there can’t be more than 2-3 threads at the bottom end. Investigating a Helicoil kit or or something else. I think I should have been more careful cleaning the serts a running a bolt into the sert before grabbing the torque wrench. All I can add is that if you do go with a helicoil now, with the partial TimeSert already in there, you'll need to have both sets of threads (those on the partial TimeSert and those on the helicoil) exactly synchronized. Good luck. If this happened on my truck, I probably would have got rid of it rather than replace the block. Devil you don't know in the replacement block there. Also, I don't understand the photo. To me it looks like a head bolt with several threads in the middle that are filled with stripped out Aluminum. I don't see any timesert there. ??? The grey part on the bolt are the section of timesert that came out of the hole. I’ve moved them around so they are not near the bottom of the bolt anymore. One theory is that there wasn’t thread locker on it. Sure there was. X5s has now come down so far in value that it's not worth fixing anymore. When I’ve gotten into situations with head bolts like this in the past, I’ve just decided that it’s time for a new block and a full rebuild. You never know what other issues there are with the block and your already mostly apart. I’d pick up a $400 short block (eBay) and have it gone over by the local machine shop. Then put it all back together with new rings, seals, gaskets, etc. It’s more than you wanted to do, but in the end, you’ll have an engine that’ll go another 200k miles. And don’t worry about the decreasing value of the car. Repairing a quality engineered car is always cheaper than buying new, or used with a new set of problems.